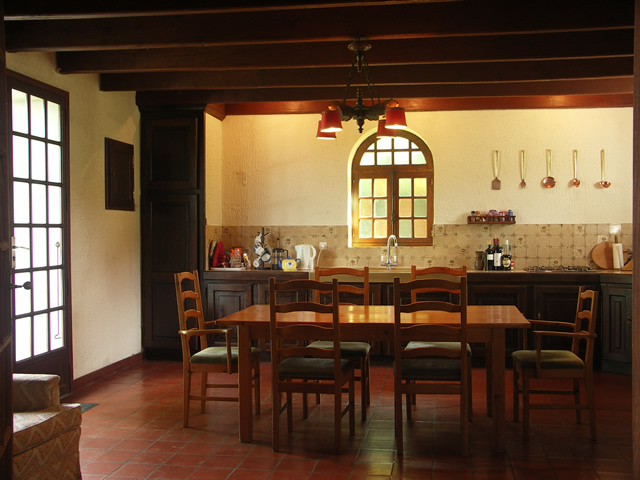 The sitting room is the heart of the farmhouse. 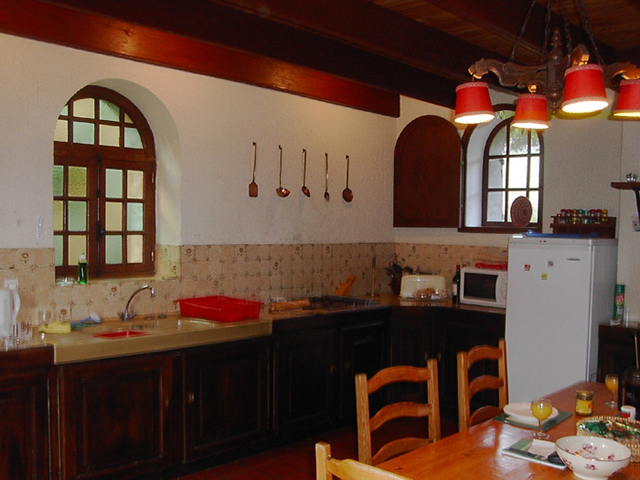 It is a lovely large room with a beamed ceiling, arched windows and a french door through to the front garden. The centrepiece of the sitting room is the attractive old stone fireplace - complete with a wood burning stove should you have a chilly evening. 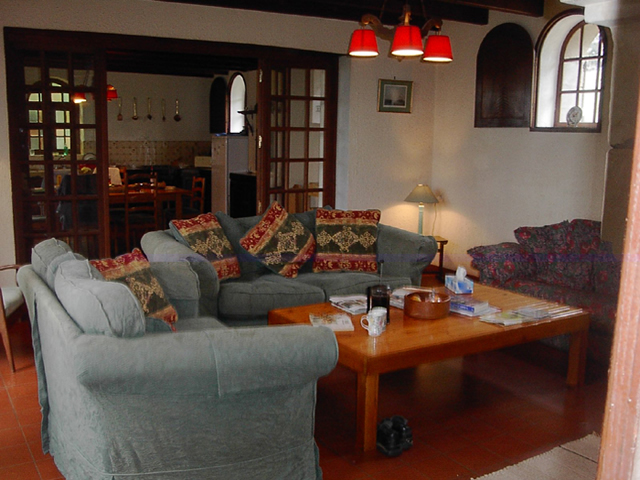 Three large comfortable settees and armchairs are gathered around a low table. There is a satellite TV system with many English-speaking channels including BBC1, BBC2 and ITV. There is also wi-fi and a DVD player (some DVDs supplied). This is another large room with a beamed ceiling. It has a fitted electric cooker, microwave, gas hob unit, double sink with arched, stained glass, window above, and a fridge-freezer. There is plenty of room for the large pine dining table and chairs so that all occupants can sit around to enjoy a meal. A large french door leads to the front garden and large folding glass panelled doors lead to the sitting room. Downstairs bathroom and utility room. Also downstairs is a large bathroom, with twin washbasins, a shower, a bath and a separate toilet. There is an electric radiator for heating. The utility room includes an automatic washing machine, ironing board and iron. All hot water is heated by electricity. 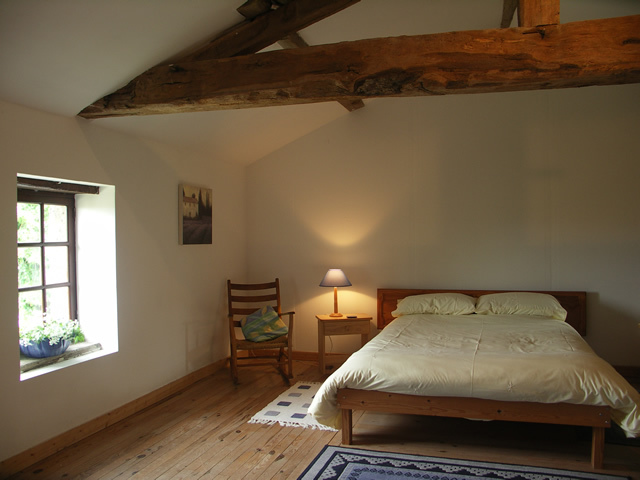 There are three large separate bedrooms with exposed beams and pine furnishings. Bedroom 1 has an en suite shower, washbasin, wc, double bed and a cot. 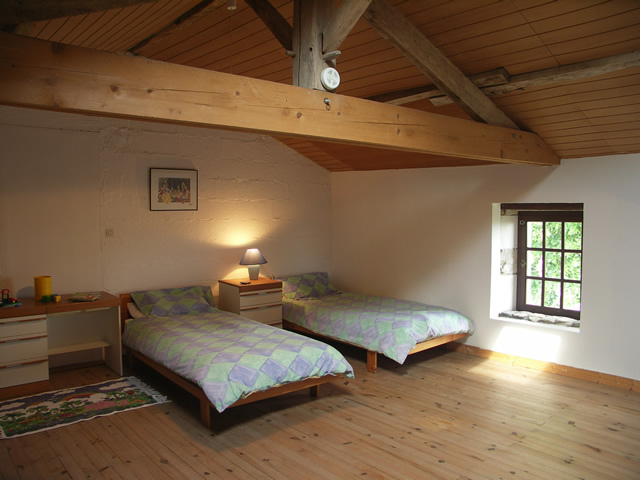 Bedroom 2 has a double bed and a small library of books that you are welcome to borrow. Bedroom 3 is equipped with three single beds and a TV with video player. All beds have duvets and pillows but please bring your own bed linen, cot bedding and towels.